In Mexico, UN Women commemorated International Women’s Day by inaugurating 50 women-only buses, known as Athena. Studies show that a large majority of women worldwide have been victims of sexual harassment and other forms of sexual violence in public spaces; in Mexico City, a recent national survey found that nearly 90 per cent of women feel unsafe on buses and on the subway. The alarming data prompted UN Women, in partnership with the local government, to launch the campaign #NoEsDeHombres, which translates to “this is not what being a man is about.” The campaign promotes what the agency says is a more respectful form of masculinity. Yeliz Osman, Safe Cities and Safe Public Spaces Programme Coordinator at UN Women in Mexico, notes that the capital is no different to other cities around the world. “The overwhelming majority of women who participated in focus groups said that they experience some form of sexual harassment in their daily journeys." According to a survey on the issue carried out by the National Institute for Statistics and Geography, the forms of violence that were most frequently reported were offensive or sexualized comments (74 per cent), unwanted touching and groping (58 per cent) and fear of being assaulted or abused (14 per cent). The fear women and girls feel ends up changing the way they live, Ms. Osman continued. “Women’s perceptions of their safety in Mexico City, as in many cities in the world, has an impact on decisions to go out at night or to take part in leisure activities; also women have to change the way they dress, they need to go out accompanied by other people, and that’s simply not acceptable. “Women should be free to move around, to go to work, to go to school, free from constant harassment and violence,” she stressed. The campaign targets men between the ages of 20 and 50 that use public transport on a daily basis, and was divided into two stages. During the first stage, the Mexico City Metro was strategically used to undertake social experiments that were filmed and made into two videos which challenge the normalization of sexual violence by placing men in situations that give them an idea of what women experience in their daily lives. The videos were then released with the goal of generating empathy and creating change in male attitudes and behaviours. To date, the videos have been viewed more than 10 million times on social network platforms, reaching more than 108 million users on Twitter with the hashtag #NoEsDeHombres. The second stage consists of posters that aim to raise awareness of the sexual violence experienced by women and girls on public transport every day and seek to deter men from committing these acts by informing them of the possible sanctions for sexual violence. At the same time, women were encouraged to report incidents. The posters were placed in different public spaces including the metro, buses and under bridges. This is the first time that UN Women and Mexico City have implemented such an innovative campaign that targets men, the objective of which is to create relationships between men and women that are more equal and free of violence. VIDEO: Encouraging innovative, locally owned and sustainable approaches to prevent and respond to sexual harassment and other forms of violence against women in public spaces. “Sexual harassment is almost considered a natural part of male behaviour and we need to transform the notion that it’s natural,” stated Ms. Osman. “It’s not natural and not all men harass women, not all men are violent. We don’t want to perpetuate stereotypes about what is to be a man or a woman. While the campaign #NoEsDeHombres was created specifically for Mexico, UN Women’s global flagship initiative “Safe Cities and Safe Public Spaces,” which was launched in 2010 with the goal of preventing and responding to sexual violence against women and girls in public spaces, has a growing list of champion cities. These include Cairo, New Delhi, Kigali, Port Moresby, Quito, Cape Town, Rabat, Marrakech, Quezon City, Guatemala City, Medellin, Dushanbe, Maputo, Tegucigalpa, Dublin, Winnipeg, Reykjavik, Sakai, New York, and Brussels. According to UN Women, studies showed that 43 per cent of young women in London experienced some form of street harassment in 2011; over 90 per cent of women and girls in Port Moresby have experienced some form of sexual violence when accessing public transportation; and 55 per cent of women in Kigali reported that they were concerned about going to educational institutions after dark. As part of the “Safe Cities and Safe Public Spaces” initiative, cities commit to identify gender-responsive, locally relevant and owned interventions; to develop and implement laws and policies to prevent and respond to the issue of sexual violence in public spaces; to invest in the safety and economic viability of public spaces and to change attitudes and behaviours to promote women’s and girls’ rights to enjoy public spaces free from violence. AUDIO: What is life like for women and girls in Mexico's most populous city? Yeliz Osman, Safe Cities and Safe Public Spaces Programme Coordinator at UN Women in Mexico, speaks with UN News. 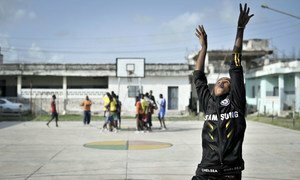 There is no more powerful platform for promoting shared values than sport, Director-General of the United Nations Educational, Scientific and Cultural Organization (UNESCO), Irina Bokova, said in a message marking the International Day of Sport for Development and Peace.